In 1991, Ben together with his mother and grandparents moved from England to live on the island of Kos, Greece. On 24 July 1991, Ben disappeared from the vicinity of a farmhouse which was being renovated by his grandparents. Ben has a strawberry type birthmark on the nape of his neck. Ben's 18th birthday is later this month. A mother whose toddler son was abducted in Greece 16 years ago hopes a new computer generated picture could help trace him. The mysterious disappearance of Ben Needham while staying with his family on the holiday island of Kos has similarities to that of Madeleine McCann. 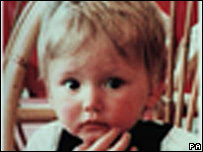 But his mother Kerry Grist, 35, believes less has been done to find her blonde-haired son who was 21 months old at the time. She hopes the release of the high-tech police photofit of how Ben may now look could help reunite him with her. Mrs Grist appealed for him to question who he was an get in touch with her if he recognised himself from the picture. She feels Kate and Gerry McCann have received a much higher because of their status as doctors compared to her as a single parent with her parents at the time. 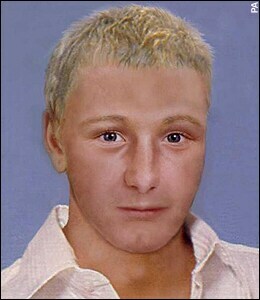 GREEK cops are launching a poster appeal to find lost Ben Needham, who vanished on Kos aged 21 months in 1991. Yesterday was his 18th birthday. His mum Kerry, 34, of Sheffield, called the campaign “fantastic news”. This is the Nedham Family Blog. With thoughts, photos, links and articles. The family of Ben Needham will never give up looking for Ben. Please take some time to look at their blog. oh my God that site is seriously heart breaking. just reading all about Ben as a child and what his little sister has written. why is the world so cruel? Looking up Ben Needham articles and I note it is coming up to another anniversary for the Needhams of Ben's abduction. He'll be 17 years missing ! Anyone travelling around Greece even this summer may be able to help. Admittedly he could be anywhere. A message to say that I'm thinking of the Needham family at this time. Hoping you will meet Ben some day soon. I was searching the net for anything new in appeals for Ben being Christmas time. I found a video dedicated to Ben for his 19th Birthday. Sorry it's late Ben but we will continue to search for you. Anything that I say which is not referenced to an original source is entirely my own opinion. May we all continue to work together to bring Madeleine home. GREEK police are poised to reopen the hunt for Ben Needham, 18 years after the Sheffield toddler disappeared from the island of Kos. Officials at the Greek Ministry of Justice and Interior have pledged to follow up any new leads in the case of Ben, who was 21 months old when he vanished from outside a farmhouse in July 1991 while being looked after by his grandparents. Well about time ! Need to look at it positively though. Truly hope he will be found. NEW dossiers could provide vital clues in the case of blond toddler Ben Needham who disappeared on the Greek island of Kos nearly 18 years ago. This would be great if he was found. In case anyone is going to Greece over the summer, perhaps ye can help with posters for Ben. The family deserve answers. Thank you. Oh good posting this here will help highlight the case even more as not everyone is a Daily Mail reader !! A MOTHER from Sheffield whose son vanished 19 years ago has joined the Missing People charity to campaign for greater rights for families with loved ones who have disappeared. Kerry Needham, aged 38, from Ecclesfield, has become an official 'family representative' for the charity - a new role created to give a greater voice to those affected when someone disappears. Her appointment coincides with the launch of the charity's Missing Rights campaign, which is asking the Government to give families of missing people the same rights as victims of crime - emotional, practical and legal support. Kerry, whose son Ben vanished when he was just two years old, said: "The pain of having a child go missing is unbearable and I support Missing People's campaign to ease the heartache and confusion by giving families of missing people the same basic rights as victims of crime. "My first task is to ensure MPs in South Yorkshire show their support for the Missing Rights campaign by signing the Early Day Motion 1158. This will show the Government just how much support there is to get families like ours the emotional, practical and legal help we so desperately need." Martin Houghton-Brown, chief executive of Missing People, said: "If your house is burgled you are automatically offered emotional, practical and legal support. If your child goes missing you may get nothing. "Families affected in South Yorkshire face injustice such as being forced into otherwise avoidable debt, homes being seized, jobs being lost and having to cope with social stigma. This can lead to family breakdown, depression and suicidal thoughts. "Family representatives will, together, vocalise the diverse needs, emotions and thoughts of all family affected." Ben Needham, who would now be 21, vanished on the Greek island of Kos, where his grandparents were renovating a farmhouse. One theory is he was abducted by a gang and sold. We, the undersigned, request that the UK and Greek Governments and Police Authorities work together to re-open and re-investigate all previous and current leads regarding Ben's disappearance. We request that the UK Prime Minister, Mr David Cameron liases with his Greek Counterpart, Mr George Papandreou to co-operate fully together in ensuring investigations are carried out properly and effectively. *Includes a radio interview between Peter Levy and Kerry.